I make money or receive products from some posts I put on this blog. If the blog is about any product, I may have been compensated with product or payment. For clarification, please contact me. When I receive a product for free, I will clearly specify that on my blog. I may occasionally make money from tweets I send out on Twitter. If you email me, all of the information in your email is mine to do with as I please. Just because I am occasionally paid to blog, tweet, etc. does NOT mean I will give you or your company a positive review, blog post, or endorsement. 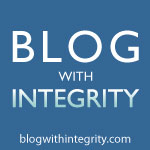 I blog with integrity. Hopefully, the above statement clears up any misunderstanding and clarifies any issues you may have about my blog posts or Twitter tweets. If you have further questions, you can email me at kjgane(at)ganepossible(dot)com. Just remember my policy about emails. See below for guidelines on the types of companies we might elect to support. Advertising/disclosures: Except where mentioned, any endorsements provided herein are freely given. Regardless of whether or not posts are sponsored, they will always be offered with honesty and from personal experience. Here at GANE Possible, we're very particular about the companies we invite to sponsor or advertise on our site. If you haven't yet been invited, and you feel your company or brand aligns well with our mission, we invite you to pitch us. We appreciate companies that empower consumers, that help make big things Possible for regular people, as well as companies that acknowledge the need for and display an effort toward better stewardship of our planet. Not perfect, but efforts to that end are appreciated and will be considered. We're all about celebrating small victories here--the strike of a match. We'd love to hear about yours. We support and participate in programs/ charities that are not administration driven, and those which empower individuals to live productive, healthy lives.